I'm so excited to show you this chest of drawers that I painted for my Star Wars mad 10 year old. It started off as plain white with some funky hardware which I like and decided to keep as is. Initially Gabe wasn't sure what he wanted and was trying to decide between Han Solo or Darth Vader. Of course good won in the end and he decided Han was by far the favourite. So we found this image on Pinterest and traced it back to Strix.org.uk. Which is a stencil generator, we wasted a good few hours creating others, it's very fun. I used a projector connected to a laptop to project the image onto the drawers. It was very easy to do. Using a pencil I quickly and lightly traced around the edges. 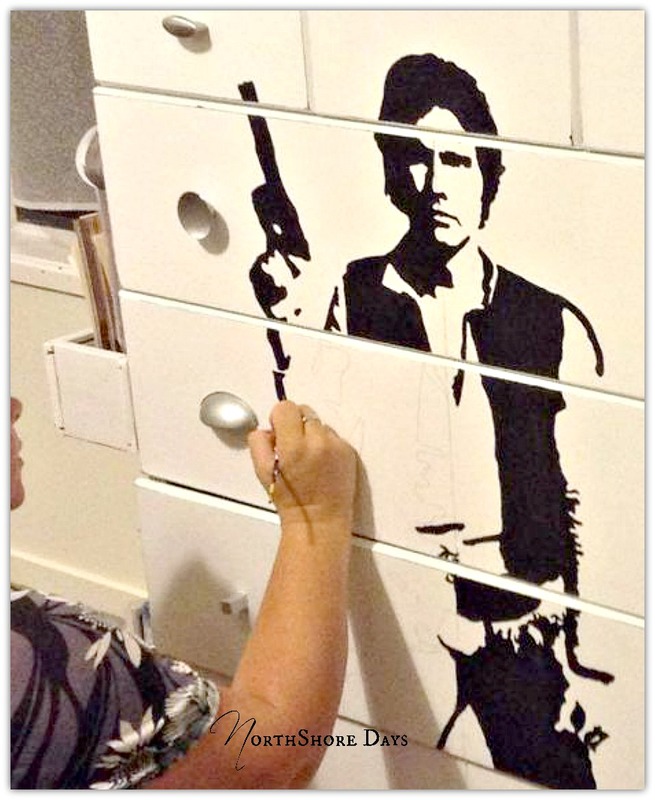 The next day I gave Han a second coat of paint. Isn't he gorgeous? Once the paint was dry, I carefully waxed and buffed the entire chest of drawers. I am so impressed with how this project turned out. It was easier than I expected and so much more fun than I thought it would be. My son just loves it in his Star Wars themed room. It is budget friendly too. It only cost the price of black paint sample pot . Incredible! I don't know if I should admit that I've never seen a Star Wars movie (and really have no desire to) but even I can appreciate this piece. It looks like something that would cost a lot of money at a fancy store. 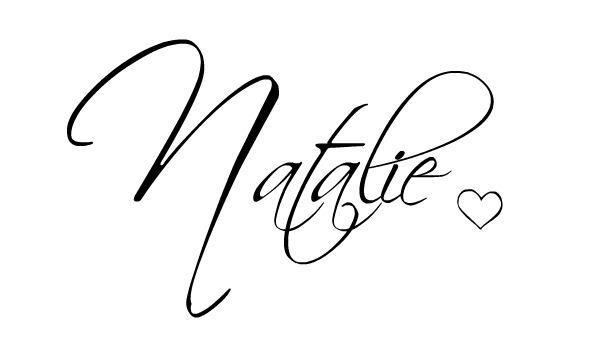 You are super talented Natalie! Any Star Wars fan would love this - definitely perfect for your son! That's genius, actual proper legitimate genius! And this idea would work with any fandom too, I love it. That is just awesome! 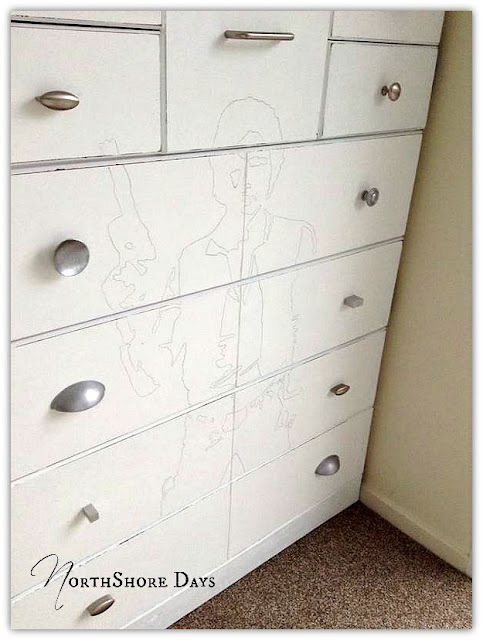 Pinning because I'm sure my son will want something like this in his Star Wars room. I hope he chooses good over evil too ;). THIS IS AWESOME! My son would love this!! 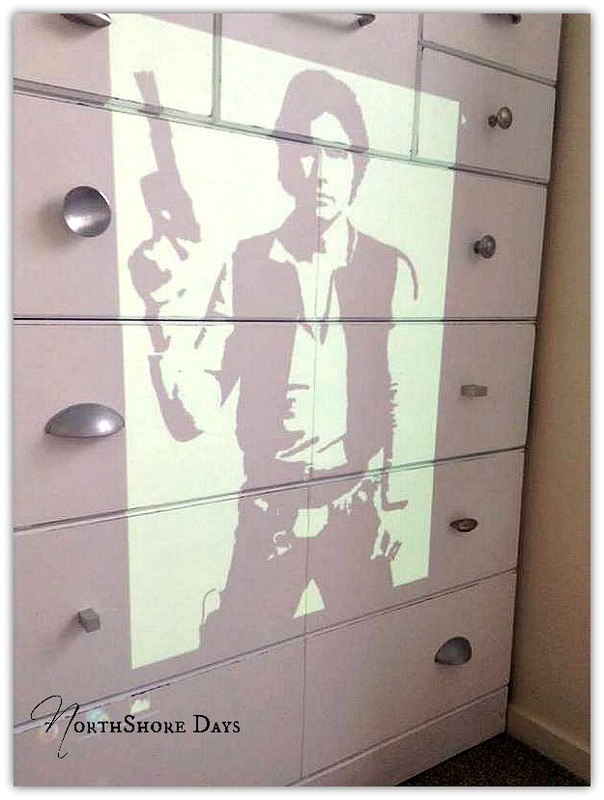 Such a clever idea of how to get the pic of Han Solo onto the drawers! I'm sure any boy would love this for his bedroom!! Thanks for Sharing at Thursday Favorite Things blog hop! Wow...that's really cool! You did a fantastic job! Thanks so much for sharing with us at Share The Wealth Sunday! Natalie, the chest turned out great! My oldest son would love it too, he's very keen on everything Star Wars related. And you're right, once he gets tired it will be easy to transform it again. Wow! You are super talented! This looks amazing!!! So glad you shared it at DIY Like a Boss. I don't know many kids who wouldn't LOVE this! What a fun idea! Found you on the Pretty Pinstastic Party!